'Kids love to crash toy cars but what happens if they can’t?' Watch as Mercedes-Benz teases kids with its 'uncrashable' cars. This rare Mercedes could sell for nearly R2-million in SA! 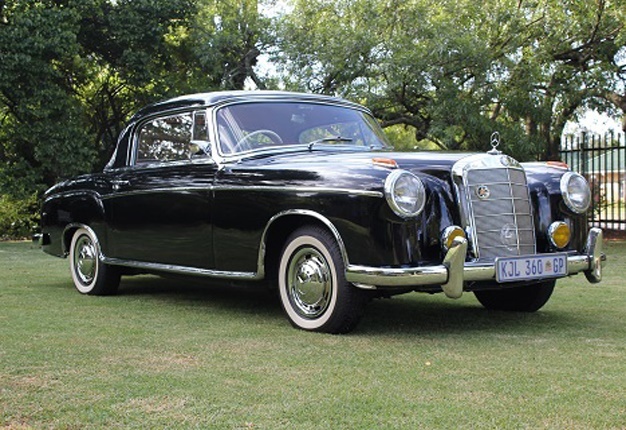 Cape Town - A rare 1958 Mercedes Benz 220S Coupe sold for R1.67-million in Johannesburg earlier in November 2015. The rare Mercedes was auctioned along with a 1968 Triumph TR5 P1 and a 1971 Rolls Royce Corniche. Stephan Welz & Co car specialist, Jack Rosewitz, said: "The car sold at auction was imported into South Africa in 1958 as a special order for Mrs. Mary Oppenheimer." Mercedes-Benz built 1251 of its 220S model in Coupe guise and several were purchased by aristocracy, famous actors and politicians. Another sale at the auction was a 1968 Triumph TR5 P1, sold for R631 510. Only 1161 TR5 units were produced for the UK market and less than 3000 globally in its 13-month production run. A 1971 Rolls Royce Corniche sold for R401 870 to a Rolls Royce/Bentley collector. The Corniche was sold in both coupe and convertible powered by a 6.75 litre V8 engine. Most of the production run was dedicated to convertibles, which makes the fixed head even more desirable for collectors. Do you own a rare or classic car? Know of any vintage vehicles being auctioned? Email us. 'If you hang your hands or feet outside of a car window, a stranger will chop them off'... Here's the 10 car myths the Wheels24 team believed as children. What were yours? 'Traffic policing to be more educational towards road users,' is one of many lessons the national transport department has 'learned' at the 2015 Global Road Safety conference. The city of Cape Town has turned to street performers to curb pedestrian deaths. 'Streetiquette' will be performed at busy traffic intersections in the city! Ford's Mustang continues to be a best-seller, Jaguar I-Pace wins World Car of the Year - check out these top motoring stories you shouldn't miss. More and more car companies are working together to create new vehicles. Here are five examples of part-sharing and synergy between car firms that you may not know about. The Eskom crisis and electric cars - how will blackouts affect first-time EV owners in SA? With winter approaching and Eskom in crisis mode, how will blackouts impact first-time electric vehicle owners? I'm a 49 year old man looking to meet women between the ages of 38 and 50. I'm a 45 year old woman looking to meet men between the ages of 40 and 48. Arabian knights - Iconic Dakar Rally moves to Saudi Arabia: What does this mean for the world's toughest race? Headed for Saudi Arabia: New Dakar venue a big win for team Hilux?